"My vinyl voice so vintage, hear the *crackling* and the *clicking*"
With three high-quality releases in less than two years, Kevlaar 7 is arguably the most consistent purveyor of pure hip hop right now. 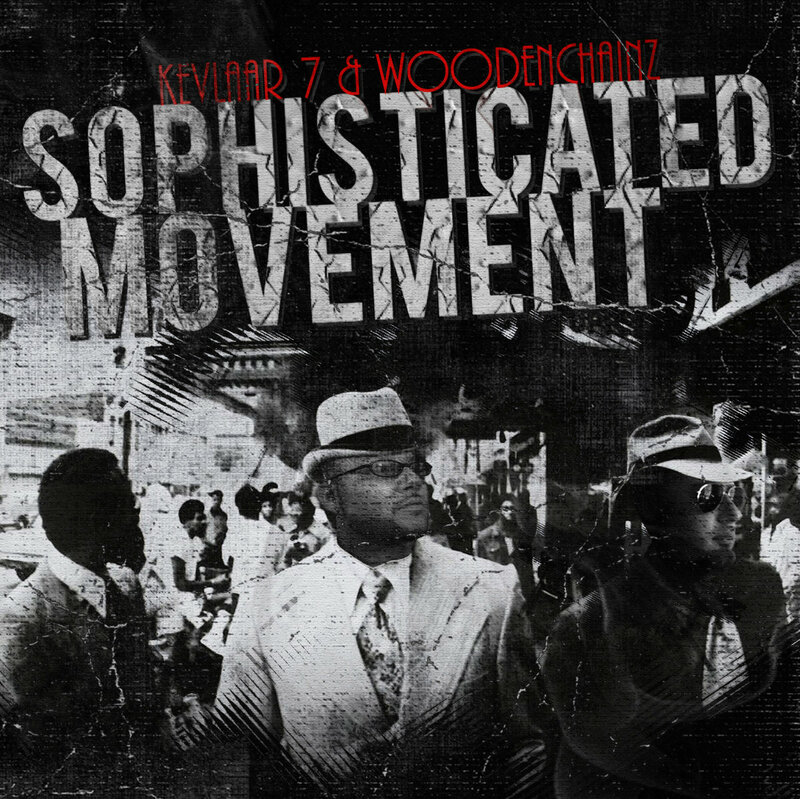 This latest offering, Sophisticated Movement, is a 15-track collaboration with burgeoning beatcrafter Woodenchainz, an album bursting at the seams with soulfulness as the sounds of decrepit Detroit's underground hip hop/blues heart continues to pour out from the Wisemen camp. As one song's spoken intro declares, "Ain't no new Motown... We ain't went nowhere, ya dig that?" It's as though we're being treated with rugged lyrical rap straight from the same soulful geographical artery that poured out decades worth of blues and soul. The cover image of Kevlaar and Woodenchainz popping up in a 50s-60s era photograph like Jack Torrance at the end of The Shining attests (somewhat humorously) to their carrying forth that musical legacy. In a recent television interview, Dr. Cornel West was asked about the legacy of America's positive influence worldwide and he responded by highlighting the importance of jazz and blues. When the TV person mockingly smiled and asked "aside from jazz and blues" what the legacy was, West retorted strongly "that's Martin Luther King, that's the legacy... Jazz and blues are about dealing with catastrophe... in the form of compassion for poor and working people." With that important point in mind, we can understand the message of this album, in which Kevlaar raps at one point, "Now I treat the hopeless/ with unadulterated dopeness." Earth flare/ kick-snare/ sun shine eternal"
Above all, Kevlaar's self-described "spoken pictures hanging" just sound good, the unorthodox wordplay a mental treat that, when in union with Woodenchainz' roaring samples and crashing drums, often makes for hip hop ecstasy. The beats follow a classic formula (soul samples and hard drums) that, unfortunately, is so often rendered by contemporary producers in a flat, formulaic fashion but which here sounds refreshingly visceral and heartfelt. Most of the record has a grainy vinyl feel to it, nothing sounds computerized or digital. Though the dragging title track and psychedelic instrumental meandering on "Ask About Me" move at a pace that can send the listener astray, the rest of the record thumps with defined intensity. Even the interludes (audio collages of quotes and clips mixed with instrumentals) have a strong pulse, becoming essential to the album experience. While two of the best tracks ("We Ain't Gonna Die" and "A New Day") are actually almost entirely devoid of drums, 'Chainz proves a percussion master, his clanky jangling drum patterns and thick bass lines can be spellbinding. The height of this is "Life's on the Clock" with its neck-snapping snares while the spectral screams on "Detroit's Agony" are stitched together by a mean percussive loop that harkens back to early Gravediggaz beats. "Boulevard Article 2" is, like its predecessor, a knocking street anthem made for boom-boxes and Kevlaar brings a colorful palette to it, spitting memorable lines like "Write rhymes in a mirror/ Reflect the interior." On "Why", the reverberating chorus of pleading voices expands an enveloping soundscape of emotion while a thick bassline and cracking snare march the song on its way (sadly, the track only features one verse before an interlude kicks in). Calling all militants/ since blackouts are imminent"
David the Sun has come/ I came as fulfillment"
Determination is a sacred gift from the universe/ to overcome the odds of stagnation"
The emcee-producer collaboration album has seen a revival lately and this soulful banger has to be counted among the best to drop these past few years. Recorded with both parties in the studio working together in person, there's a discernible cohesive chemistry that many modern rap records lack. Above all, the nuanced lyricism stretched out over a landscape of soul-drenched instrumentals make for a record that will likely remain sounding fresh ten years from now. This being his second underground classic released already in 2012, Kevlaar 7 has quickly become one of the best kept secrets in hip hop.